President Donald Trump invited members of Congress for lunch on Tuesday, but House Democrats turned down the invitation. White House Press Secretary Sarah Sanders criticized Democrats for refusing to work on a deal to end the partial government shutdown and fund border security. The White House had hoped that more moderate Democrats would be willing to at least talk to the president about a bi-partisan solution. Sanders confirmed that Trump had proposed a deal that would fund additional technology to screen ports of entry, allow minors to seek asylum in their home country, and fund a physical barrier of steel on the southern border instead of concrete. 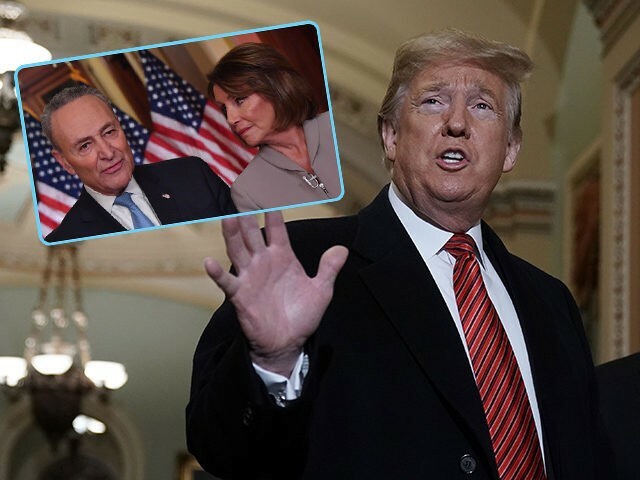 “As Senator Schumer and Speaker Pelosi refuse to negotiate, President Donald J. Trump and his team are working hard to find solutions to solve the humanitarian and national security crisis at the border and reopen the government,” she wrote. Reps. Susan Brooks (R-IN), Rodney Davis (R-IL), Doug Collins (R-GA), John Katko (R-NY), Brad Wenstrup (R-OH), Rep. Jodey Arrington (R-TX), Van Taylor (R-TX), Anthony Gonzalez (R-OH) and Clay Higgins (R-LA) were on the White House guest list. The White House did not reveal the lunch menu. On Monday, President Trump personally paid caterers to bring fast food to the White House for the Clemson football team to celebrate their national college championship victory.